Tony Blair’s foreign secretary, who held office during the 2003 invasion of Iraq, is being lined up for a seat in the House of Lords. He could be granted the accolade before the results of the Chilcot Inquiry into the legality of the war are published. 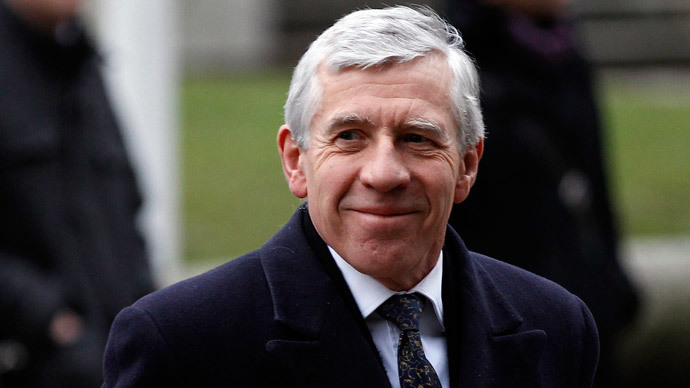 Jack Straw may be offered a place in the Lords after he steps down as an MP in May, and he is understood to be open to the idea of a peerage. One senior Labour source told the MailOnline that Straw was “on his way down the corridor to the other place,” but if he accepts an offer, he could be made a peer before the highly anticipated results of the investigation into the invasion of Iraq are released. The Chairman of the inquiry, Sir John Chilcot, faced a cross-party committee last week to explain the ivestigation’s four-year delay, which last took evidence from a witness in 2011 and is reportedly nearly one million words long. Straw, who was foreign secretary between 2001 and 2006, is expected to face heavy criticism when the report is finally published, with sources saying he is one of around 30 people to receive letters warning them of hostile content. Downing Street insiders say the report is likely to be a “devastating” indictment for the Blair government and members of the Whitehall establishment. Straw has previously said rumors that witnesses are responsible for the continuing delays to publication were “wholly without foundation” and insisted it was in the best interest of MPs to see the results of the inquiry as soon as possible. He said he would deliver the report “as soon as we possibly can,” but said he would not rush the process of ‘Maxwellisation’ – the opportunity for criticized parties to respond – to speed up publication. There has been widespread public frustration at the delays to the report, but Chilcot confirmed it would not be released until after the general election in May.